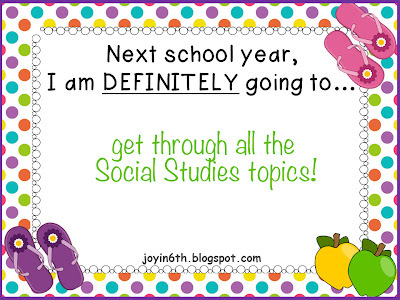 Upper Grades Are Awesome: Next school year, I am definitely going to . . . I've been following Kim at Finding JOY in 6th Grade since I started this blog last summer and I am so excited to participate in her first linky party - What will YOU do differently? I'm also excited because this is something that I do every year anyway. It seems like once state testing is over my mind starts to think about all the end-of-the-year tasks to complete as well as all the changes that need to be made for the next year. I've always got a post-it with ideas jotted down or a list going on the computer. Some of the items are small, for example, I need to buy some screw eyes (you know those screws that have a loop on the end) to install in my window area for hanging student work. And some are a bit heftier, like being a team leader! Two of our amazing 5th grade teachers (half our team) are transferring to another school in the district so I have been asked to be team leader next year and not only will I be a first time team leader, but I'll have two new (to the district and grade-level) teachers to help. Have you ever tried out something that you saw online or heard of from a colleague and it just didn't work for you and your style? This has not been the case with Class Dojo and Class-Yes. I tried both of these strategies out in the the last quarter of school and I am glad that I didn't wait until next year because they have both STUCK. Both have worked wonders for my chatty, too-often-off-task class, and I will DEFINITELY be using them next school year. In the 5 years that I have been using a classroom economy system it has evolved and improved each year. But it is still far from perfect. I still haven't figured out what changes I am going to make yet, but I need the system to be more streamlined and take less class time. My bankers had been using Google Docs (now Drive) to manage bank accounts, but something happened with our district's filter (?) and suddenly Google was unavailable to the students. So my bankers had to use my computer, which you can imagine was a pain. I recently stumbled upon mykidsbank.org. I set up an account and toured through it a bit and it looks like a great alternative. Each student has their own account, but I can also create teller accounts so that my bankers are able to enter checks. I also love the bank note generator. They can be created to have any amount of money and each have a one-time-use code. I will DEFINITELY be using this site as part of my classroom economy improvements. Marzano is the new model that our district has adopted for teacher evaluation and the buzz for next year is to include more student data tracking. 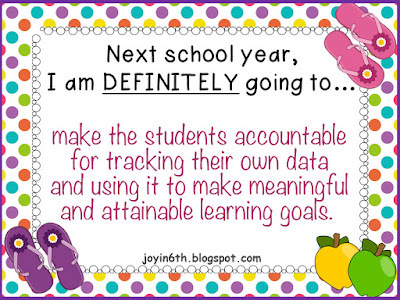 This is great, because I had already been planning on making this happen in my classroom. 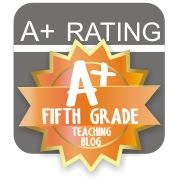 I've seen several great resources online and on TpT and I will DEFINITELY be investigating them and planning a system for my new 5th grade class. Eeks! One of the challenges of moving to a new grade level (even though it isn't entirely new, it's just been a few years), is the different topics, especially in social studies and science. I relied on my new team to give me the lessons/activities they had done in the past, and to make sure we stayed on track. But that fell through the cracks, especially in social studies. Prepping for JA BizTown took a lot of instructional time as well, and that set us back. We should have covered American History starting with the first people and ending with the Civil War. Instead my class ended with the American Revolution. We never got to Westward Expansion and the Civil War. We will DEFINITELY be covering everything next year! Thanks for the awesome linky Kim! Can you tell us more about Class-Yes? Basically it is from the Whole Brain Teaching program/method. You teach the students that when you say "class" they stop whatever they are doing, face you, and reply "yes". To make it fun you can mix up the way you say class and the students have to respond in the same way. It's a quick, and sometimes fun, way to get all the students attention quickly. I'm with ya on the SS topics. I am desperately trying to compile a list of books for my topics so that I can get prepared. I'e never taught SS before.